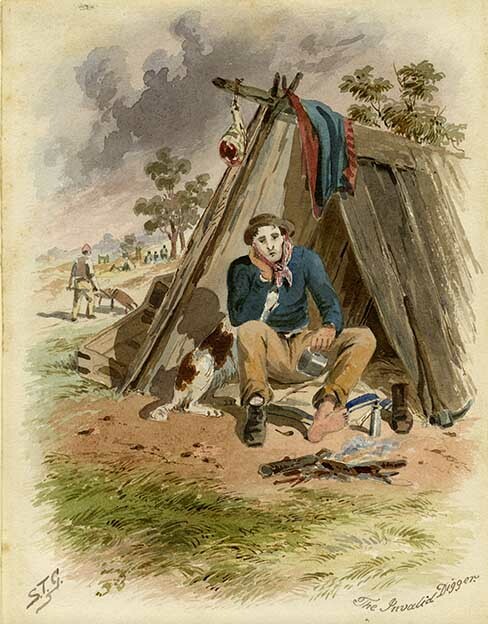 Samuel Thomas Gill, The Invalid Digger, c1852, watercolour and gum arabic on paper. St Paul's Ballarat, University of Ballarat Historical Collection. 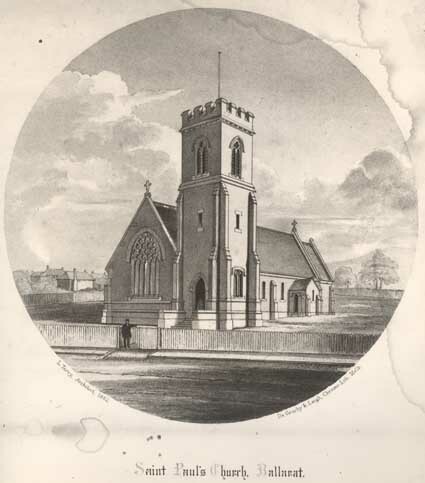 In 1855 Dr Stewart was involved with St Paul’s Ballarat. He listed himself as a physician and surgeon when he signed the Benden Sherritt Hassell Compensation Case Petition in 1855. He also signed a petition of householders of Ballaarat requesting the establishment of a Municipality in 1855. He was a member of the first Ballarat Council in 1856, and was elected as Honorary Surgeon to the Ballarat Hospital on 16 July 1856. Dr Stewart was Chairman of the Ballarat West Municipality in 1858 and 1859. He was also a trustee of the Ballaarat Mechanics’ Institute, and Director of both the Gas Company and the Bank of Victoria. Dr Stewart returned to London in 1869, practising medicine there. He died in England in 1906, leaving large bequests to several Ballarat institutions. THE LATE DR. JAMES STEWART. A PICTURESQUE CAREER. The death of Dr. James Stewart, late of Bal larat, with the splendid bequests made by him to the University and hospital in Melbourne and charitable institutions in the city of Ballarat, lately announced by cablegram, calls to memory the early gold-digging days of Ballarat. The late Dr. Stewart was a North of Ireland man, and, like many other young fellows at that time, left home at the early age of five and twenty to seek his fortune on the gold fields of Victoria. He worked as a miner on the fields of Ballarat during the rush, but not for long. It soon came to the knowledge of the miners that young Jim Stewart was a medico, and they commenced to consult him with reference to their ailments. Young Stewart found that there was more important work at hand than handling the shovel or rocking a cradle, so he commenced the practice of his profession in earnest. His large round white tent, which the erected on the gold-field for the purpose of a surgery, will still be remembered, no doubt, by some of the old miners who worked on the field at that time. Dr. Stewart afterwards became the leading medical man in Ballarat, and up to 1866 followed his profession, when owing to ill health he disposed of his practice and returned to the old country. At the meeting of the miners at Bakery Hill, when the obnoxious mining Licenses were burnt, which led to the Eureka Stockade riots in 1854, Dr. Stewart was appointed by the miners as a sort of referee. Dr. Stewart has related the story of how Peter Lalor, the leader of the riots, and who after wards became speaker of the Legislative As sembly of Victoria, lost his arm. The doctor was called by his excited man servant the night after the riots and informed that there were two men outside who demanded at once to see him. Hastily coming out he found two miners supporting a third, whom by the aid of the lan tern he recognized as Lalor, the leader of the riots. Making a hasty examination the doctor realized that the case was urgent, as Lalor's arm was shattered by a musket ball. There and then, so to speak, in a coach-house and by the light of a lantern, the arm was amputated. At that time a reward of £500 was being offer ed by the Government for the apprehension of Peter Lalor. How Lalor and his brother miners were tried and acquitted is a matter of ancient history. The fee received by the doctor for the above surgical operation was £1000, which was enclosed in a packet and forwarded to the doc tor anonymously. The death of Dr. Stewart has removed one, if not the last, of those identified with the early history of Ballarat. We are favoured with the above particulars by Mr. H. Fynmore, of this city, who is a nephew of the late Dr. Stewart. OBITUARY - EX-BALLARAT RESIDENT - LONDON, 13th June. The death is announced of Dr. James Stewart, of Ballarat. The estate here is worth fully £200,000 sterling. The deceased gentleman, in his will, made many bequests to charitable, educational, and religious institutions in Melbourne and Ballarat. The death is announced of Dr. James Stewart, of Ballarat. The estate of Dr. Stewart in England is fully £200,000. Many bequests are made to charitable, educational, and religious institutions in Melbourne and Ballarat. Dr. Stewart arrived on the goldfields a young man of 22 In 1853, and his tent hospital at Black Hill is well remembered by the old pioneers. He was lucky in mining investments, particularly in the New North Clunes Company, from which he drew £40,000 after he settled in London. He was chairman of Ballarat Municipality in 1858-59. ↑ Goulburn Evening Penny Post, 04 August 1906. ↑ Sydney Morning Herald, 14 June 1906. ↑ Bendigo Advertiser 14 June 1906. This page was last edited on 30 April 2018, at 03:33.